Thought ‘climb every mountain’ was only in Sound of Music? 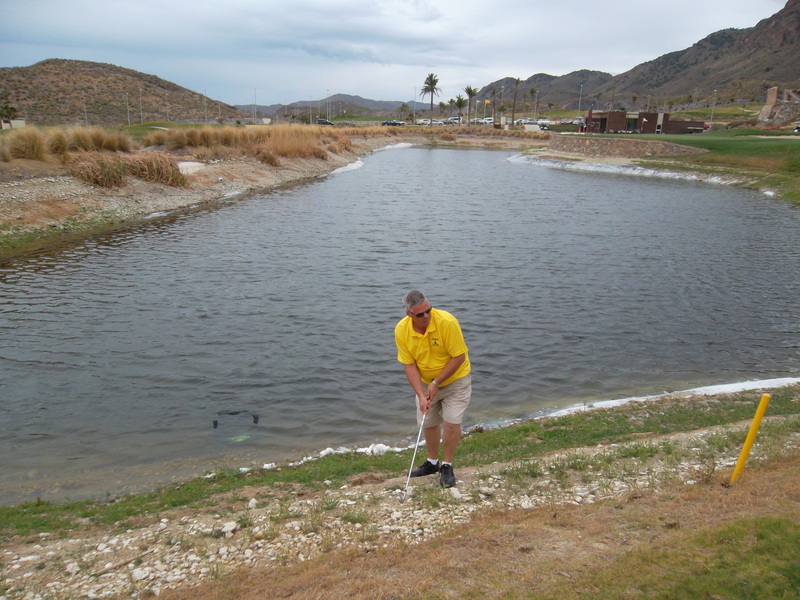 A lovely par 3 overlooking the sea…………..
Phil playing out of lake – in wrong direction? … it’s behind you………..
Another difficult approach shot from Neil……..
Amazing what lengths golfers go to, to avoid incurring a penalty drop! Couldn’t resist posting this one of the canaries with a cuckoo in the nest! This the shot that Les preferred! 16 of us set off in convoy to Aguilon golf for their Seve charity day competition. Along with 12 golfers, there were also 4 non playing wives who would have a great day in the little known beachside resort of Terremos, just a few minutes from the course. It seems that it was quite lively for a Sunday with a bustling street market and many shops open. t-shirts to our Seve day. The weather was gorgeous as we teed off with cloud and wind to follow later in the day. 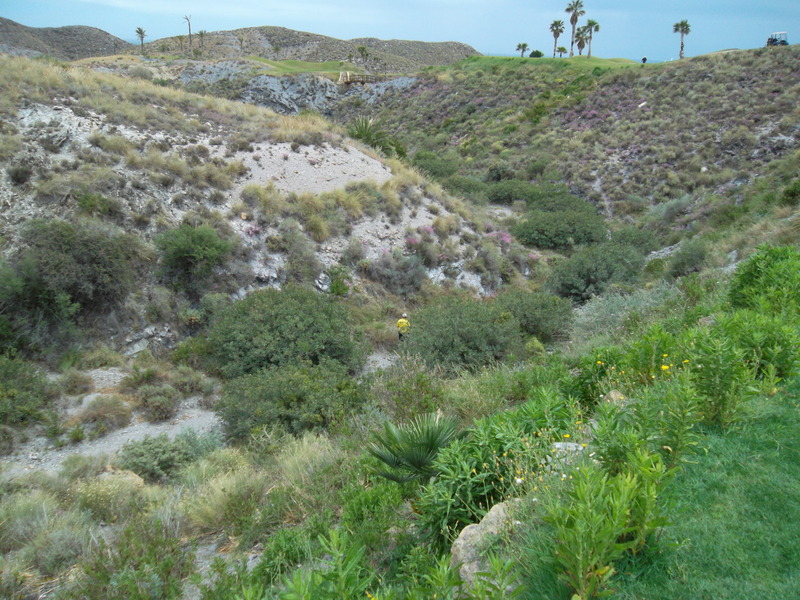 The course is very tricky with any wayward shots finishing up in the canyons and lakes spread about the course. The greens were lush although a bit slow. 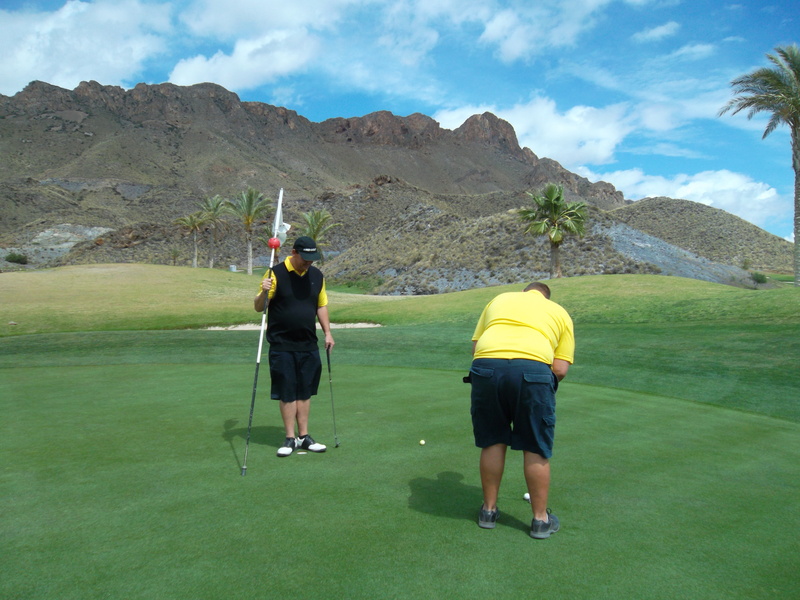 The surrounding scenery was fantastic and helped the golfers to ignore their bad shots. The best score from our group was 28pts by Peter Beatt, but this was enough to secure him runner up spot in division one. Well done Pete! He got a lovely glass momento supplied by the Seve foundation. I have included a few photos of the day – Les didn’t want me to publish the one of him centre stage in the bar, but it was so good I had to ignore his pleas! Aguilon have made us some super offers to go back, even offering to reimburse us the motorway toll fees! Fine weather again, but the greens were covered in sand as a result of the hollow tining operation carried out this week. 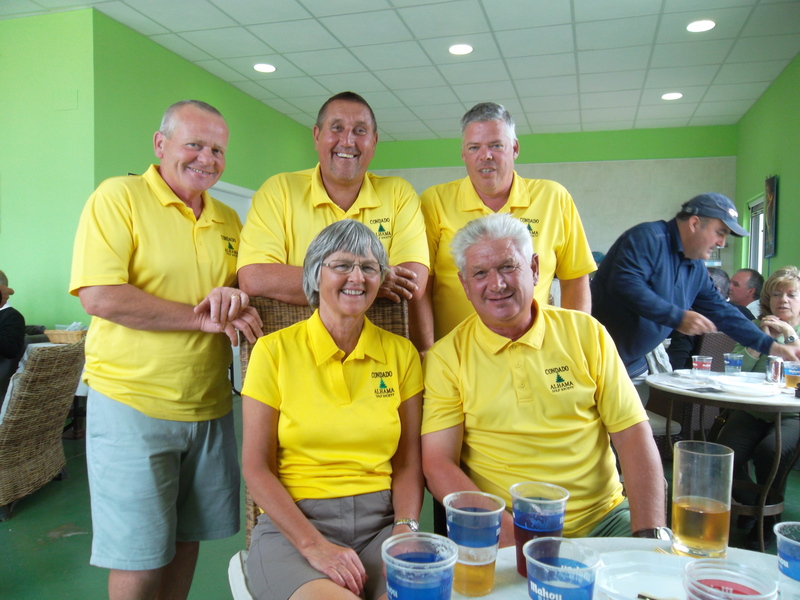 The competition this week was a pairs stableford with 40 players and looking at the numerous good scores, the sandy greens seemed to help the golfers. 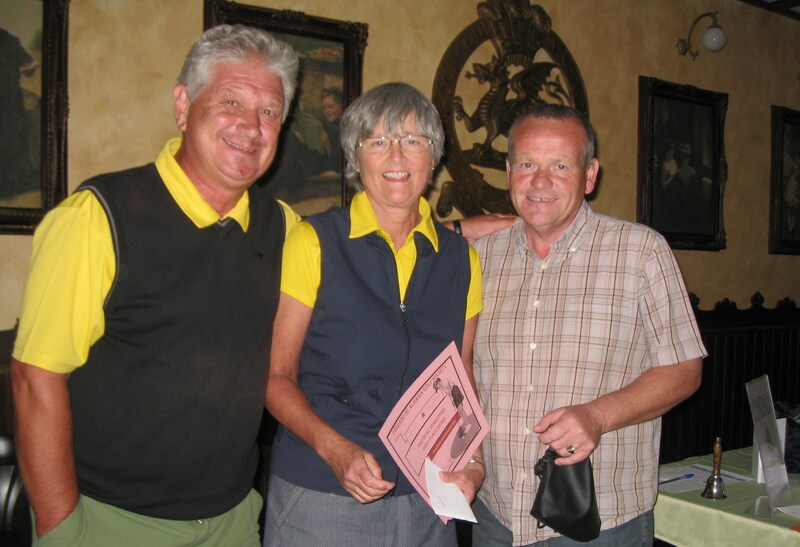 Fred and Bernie Twomey kindly donated 3 bags of golf balls (30 in each) which were auctioned after the presentation. The Seve fund received 51 euros from the sale of these. Fred and Bernie will donate some more to be auctioned next week. The winner of the ‘guess how many ball in the jar’ fundraiser was Phil Tann (79). I did not inform him of this until after he had bought one of the bags of balls though! Sunday we have 12 players playing at Aguilon golf in their Seve charity day. They have also been very generous in giving us vouchers for 6 green fees and 4 Aguilon tee shirts for our own Seve day. Next week sees a change to the scheduled lone ranger competition. This is basically a yellow ball, which we played only two weeks ago. We have decided to have a 1,2,3 waltz which has proved to be popular in the past. It is followed by a night out at Maria’s in Bolneuvo. This is a 3 course meal with wine for only 5 euros (subsidised by Peter Reeves). Transport is 6.50 euros. I have been informed by a reliable source that work on the temporary clubhouse will start next Wednesday. Trees and bushes will need to be removed from the mound separating the 1st tee and the practice area. We hope that this will not another false dawn. At the gala day on May 6th (Condado Club) there will be a table top sale (5 euros a table). If you have any unwanted items but don’t want to run a table of your own, you can donate them to the societys’ table. All our proceeds will go to the Seve charity. This was my last presentation as captain – Kevin Smith will take over on Tuesday May 1st. I have had a great year, making many friends, and I have seen the society grow from strength to strength, with over 800 members. My thanks go to the committee who have done a marvellous job, allowing me the time to enjoy the position of captain. I wish Kevin and Paul all the best for the coming year and will be there for them if they need any help. 1. 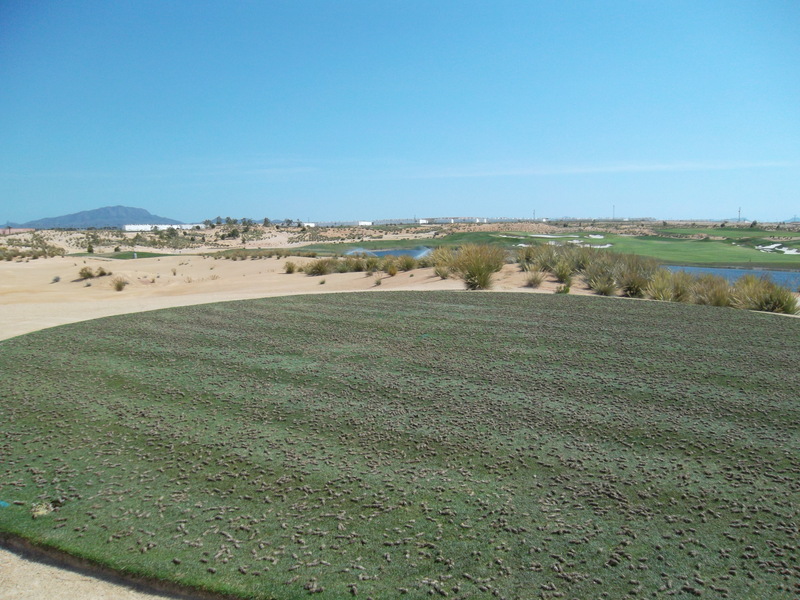 The view over the lake to the 10th after sanding………. 2. 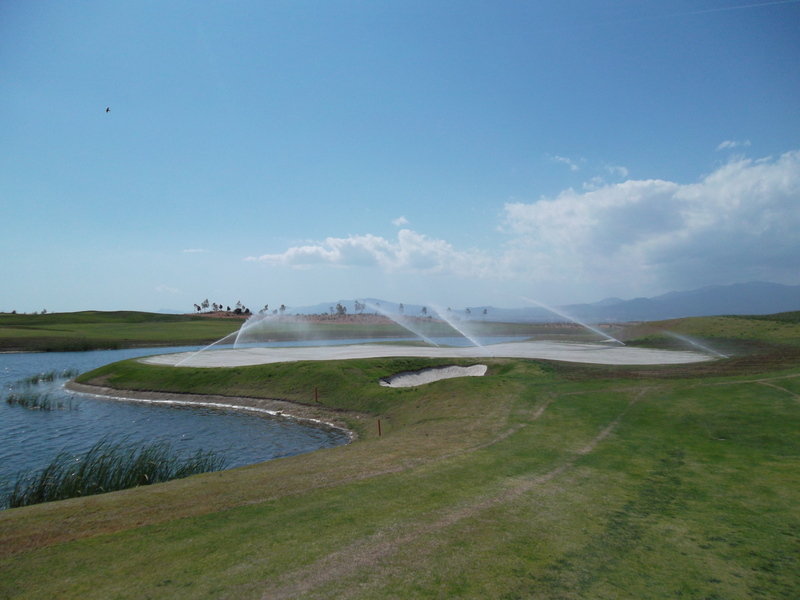 Hollow tining and sanding done….now time for the water! 4. Number 12 now sanded…..
5. 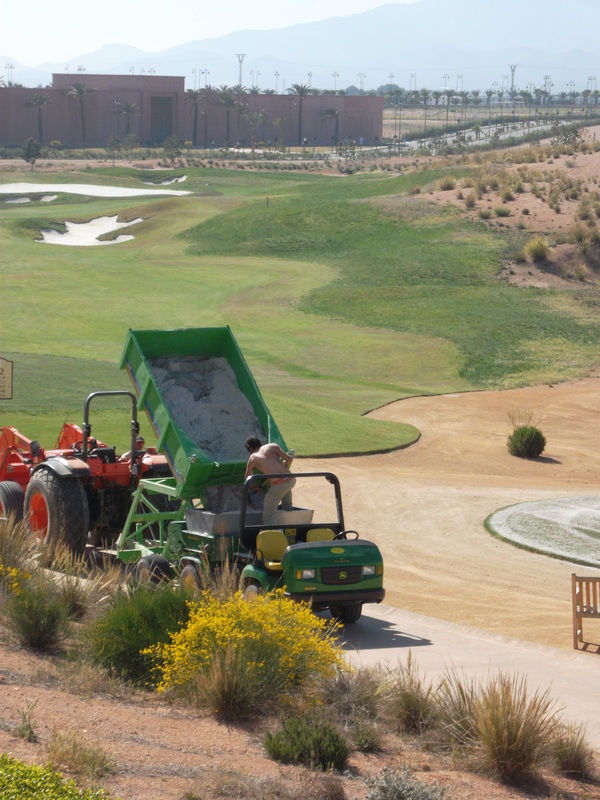 Yellow tee on 12 requires sand bucket filling……..
6. One for the girls as Tarzan fills it! 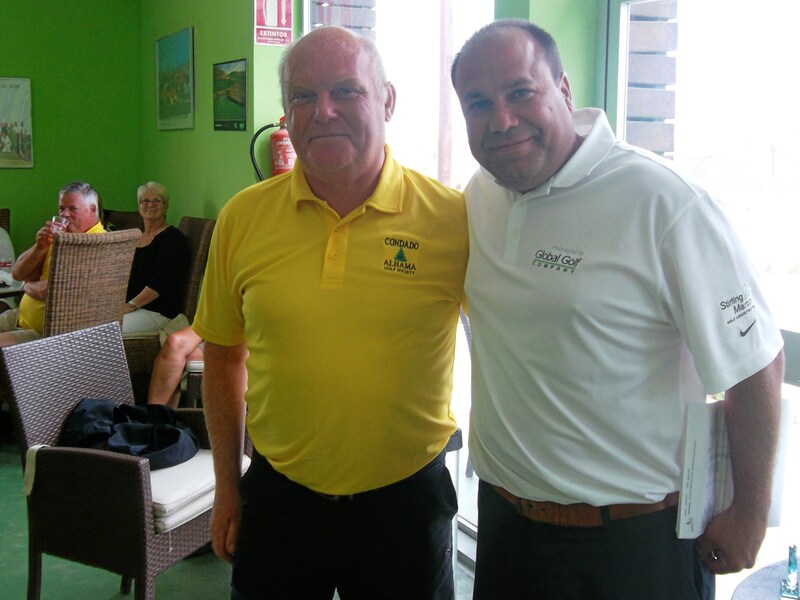 After much too-ing and fro-ing the match was finally arranged and went ahead at Mar Menor. The sun shone, and there was a breeze from about 1.30pm. The match was played as a pairs matchplay and the result could have gone either way, right down to the last putt. The scores were tied at 4.5 to 4.5 – this meant that we retained the trophy as the current holders. Kevin Smith, Jim Alwell, Neil Simpson, Les Hurren, Ann Ju Boifot, Bjorn Boifot, Paul Briggs, Robin Wilson, Terry Burgess, Kjell Mundheim, Dave Dale, Tom McFarlane, Colin Lloyd Linda Lloyd, Scott McKetchan, Dave McCulloch, Hans Pfister and Gaby Pfister. The greenkeeper and his staff have worked really hard over the last 3 days to complete the hollow tining program (see above). Hopefully we should have a course in fantastic condition throughout the summer months. In 11 days time Kevin will take over from me as captain. I shall take up the role of president. We are seen here giving Eli Holdhus her certificate for winning the ladies prize at the March individual stableford.. This week was a yellow ball competition and 40 players took part. The sun shone but again we had a strong breeze which seems to have been with us for two or three weeks. A lot of the scores were close, but two norwegian couples took 1st place, followed by two irish couples. It seems that everyone is aware of the scorecard box being behind the 18th green – all cards were posted. 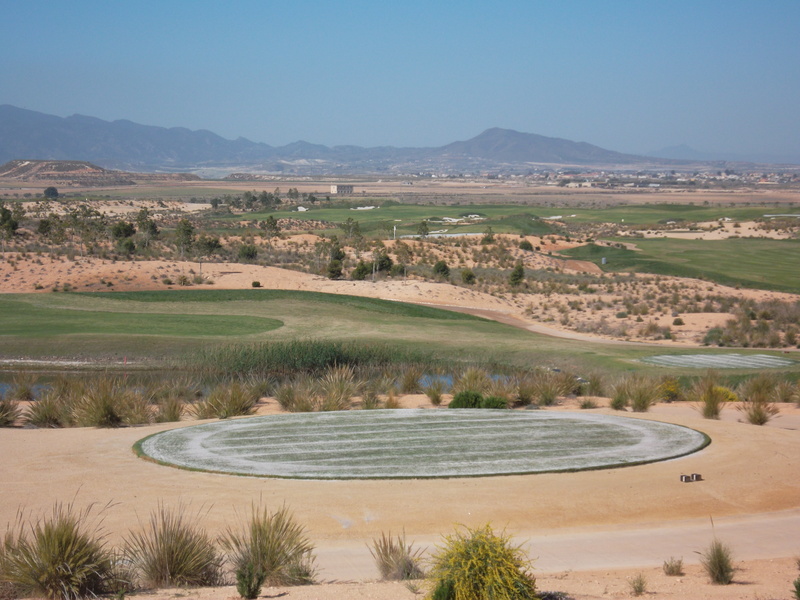 Next week will be quite a busy one, with the Mar Menor challenge being played at Mar Menor on Monday. This has been arranged due to the closure of Condado from 12pm Monday until 08.30 Thursday (course maintenance). They did originally say that it was too short notice when Graham approached them 3 weeks ago but have now decided to go ahead. We are the current holders of the trophy and will do our best to retain it on their course. There is no Wednesday competition with the course being closed. On Friday it will be a pairs betterball stableford and Sunday is the awayday to Aguilon for their Seve charity day. 35 euros for golf with buggy, prizes, barbeque and unlimited beer or tinto verano is a fantastic deal according to my yorkshire values! On Friday May 4th Peter Reeves is subsidising a 3 course meal (with wine) at Marias restaurant in Bolneuvo. The cost for this is an unbelievable 5 euros! Transport will be arranged for those who require it at 8 euros per person. All society members are invited but if you want to go you must inform Kevin by Monday April 23rd. Sometime next week Kevin will install a society noticeboard in the Clover. This will be on the connecting door to the Bulgarian restaurant. Starting sheets and handicap lists will still remain in the golf shop corridor. Our thanks go to Neil and Lynne for providing this space, the shelves for our trophies, and the regular supply of sandwiches on Fridays. Barbeque and presentation to all competition winners. Lucky domino draw and football card draw. Entertainment by Woody (a great Buddy Holly tribute). No cover charge but donations in the bucket will be welcome. The entry fee of 5e will include a putting competition, nearest the pin, longest drive. 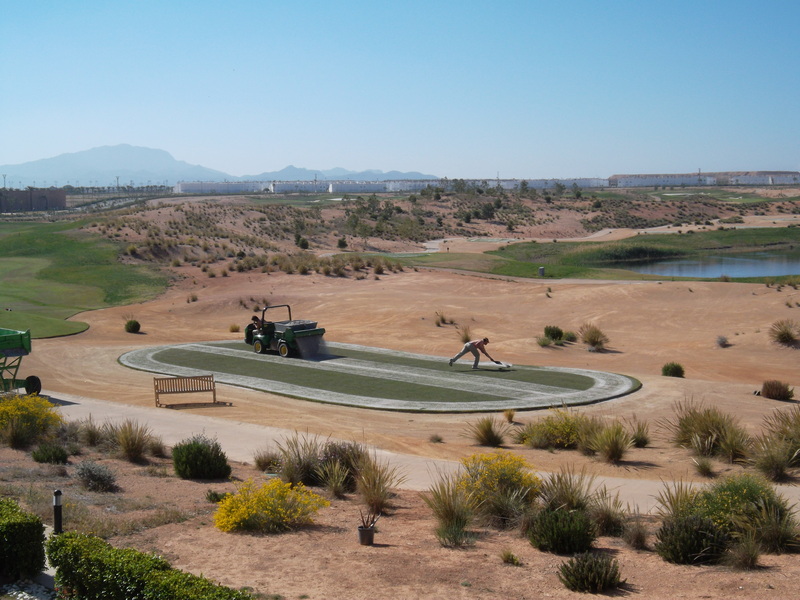 Every tee and practice area has been sponsored by businesses or individuals (20e). Drinks/cakes will be available at the 12th tee (1e each). The main trophy (to be held with the society major trophies) will be a framed picture of Seve in iconic pose after holing the winning putt at St Andrews Open championship (see above). Throughout the day a DVD of Seve’s life will be shown on the big screen in the Clover. The presentation will be in Bulgarian restaurant at 7.30pm followed by meal for those who book. (This is not compulsory so ecveryone can attend the presentation) . About 9pm there will be music in the Clover bar next door, followed by auction at 10.15pm, then the raffle draw. At 11.15 the entertainment resumes. A collection bucket passed round during evening. Auction items so far include one weeks accomodation in Kissimee Florida; TV box; Swindon Town football shirt (Wembley 2012); Golf vouchers and hopefully about another 5 items to be confirmed. We are still looking for small donations (sleeve of balls, wine, or similar) which can be used as golf or raffle prizes. I will try to post an update each week until the event starts. This week was the monthly Apollo Air sponsored individual stableford. We again had a record entry of 76 players, but this did not count as 26 did not venture out due to the heavy rains. Many players had already parted with their green fee money before the heavens opened – more or less exactly as the tournament started at 08.30. Just after 10.00 the breeze arrived and blew the rain clouds away, so with the wind arriving one problem was replaced with another. Please note that we now have a scorecard collection box at the back ot the 18th green – it is on the way to the car park but some left the green in the opposite direction. Next week is a 4 person yellow ball competition. A reminder of the Seve charity day at Aguilon golf on Sunday April 29th. 35 euros with lots of freebies. Places will be limited so get your name down early. 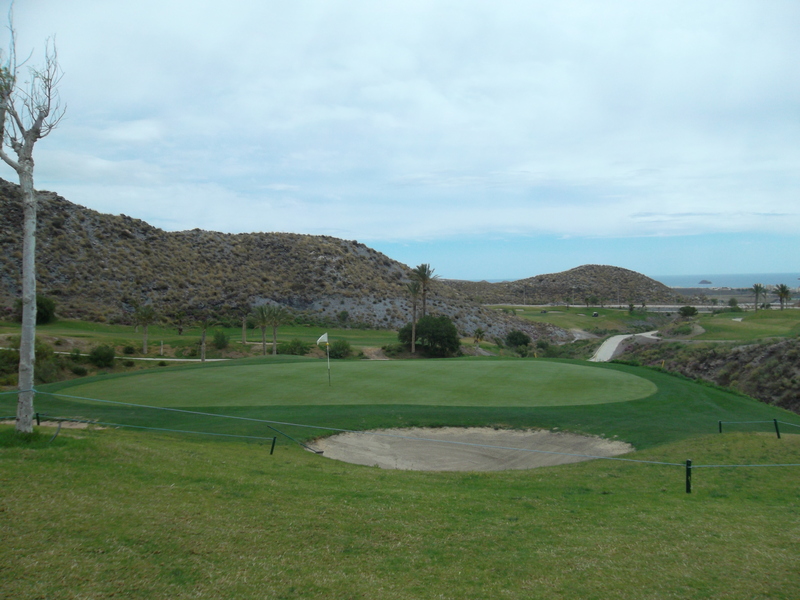 The Mar Menor challenge match scheduled for Monday April 23rd had been cancelled as the opposition felt they did not have enough notice. This will probably now be played in September. The course will be closed for hollow tining from Monday April 23rd (12.00) until Wednesday April 25th. During this time members can play any of the 6 courses for their usual 7 euro fee. 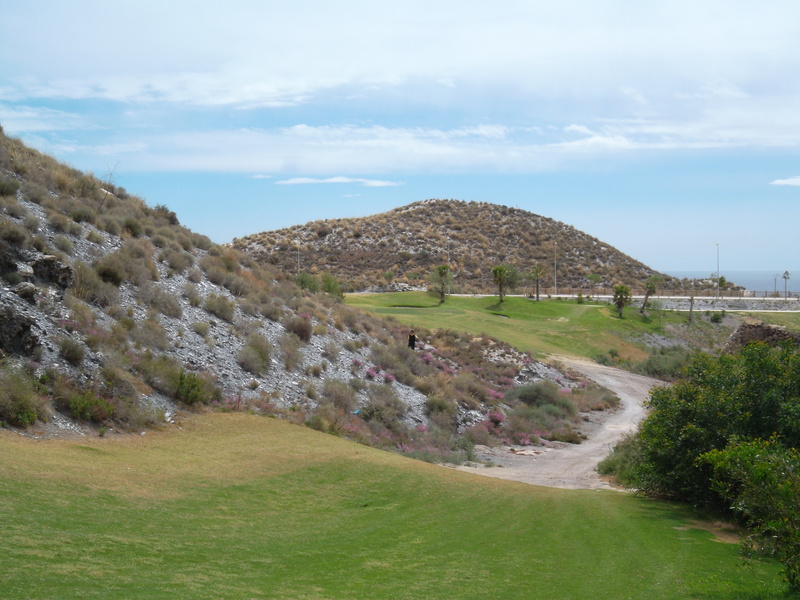 Graham is trying to arrange an awayday for the Monday at Lorca (a new course recently opened). This should cost about 25 euros each with buggy. When we have a date confirmed a list will go up in the shop. 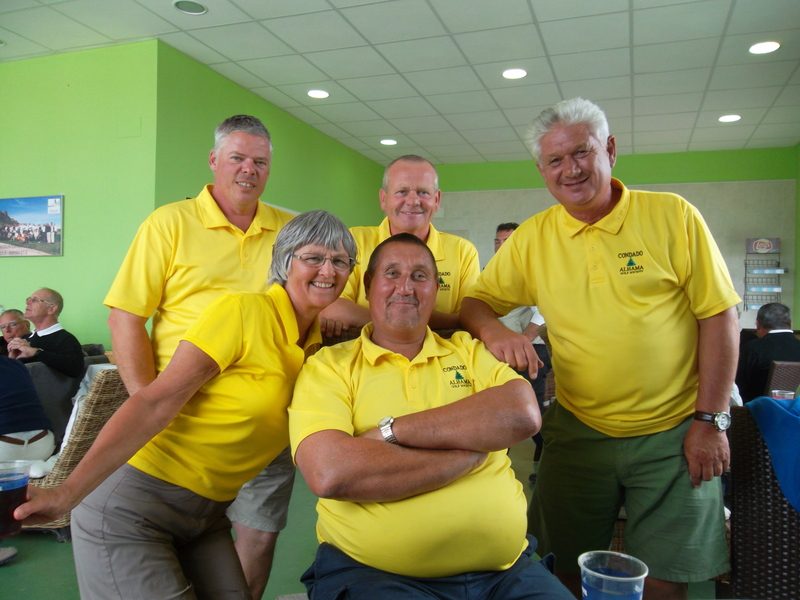 The Seve Trophy for May 11th is a success already – we are assured of at least 1200 euros with lots more fund raising still to be done. In the next week we hope to have another meeting and perhaps post a list of jobs which need covering. Volunteers can put their name against any of the tasks. The presentation will be in the Bulgarian Bistro at 7.30pm and we have 2/3rds of the restaurant reserved. The committee are not booking tables – it is up to individuals to book their requirements directly with the restaurant (from 7.30). The meal will follow and will be a choice of 3 starters, mains and desserts and will be simple, chicken, beef etc with rice or chips so food can be served quickly. Anyone not eating can still attend the presentation and leave at 8pm to get their seats in the Clover ready for the evening entertainment. This should be at around 9.30 to 10pm with the grand auction fitted into break times. We had a meeting with Global Golf management on Thursday and clarified some issues, while others still remain to be resolved. We get one green fee voucher for all their courses for each Friday comp we play, but we now know that this is related to throughput also. Each quarter we get more vouchers based on the number of full paying visitors (not members) playing with the society (Mondays, Wednesdays and Fridays). Another interesting point was the issue of insurance. Players are now charged 3 euros each for insurance unless they have proof of their own cover. The spanish golf federation charge 72e for annual cover (which I have), but seemingly it is available for 34e if you do not want to play in any of their organised tournaments (not a lot of people know that!). One of our members, Peter Reeves is organising an evening meal at Maria’s in Bolneuvo (formerly Plonker’s bar) on Friday May 4th so if any members want to come along please contact Cath. The meal is really good value and transport may be available 5/10 euros each). It may have gone unnoticed, but we had an EGM on Thursday night in the Condado Club. This was in response to some members suggesting that they may want to fill the posts of secretary and social secretary which were not volunteered for at the AGM. In the event nobody volunteered (again) for the posts so Cath kindly reviewed her situation and offered to continue in those roles. 18 members turned up for the meeting (including the committee!) and it took less than one minute to open the EGM, vote for Cath (unanimous) and close it.